The Slow Moving Vehicle triangle is just another part of the scenery in most Amish communities. The majority of Amish people willingly use the warning insignia and probably give it little thought. In most places they are such a standard part of the buggy’s appearance, that it is odd to see a vehicle without one. Some Amish object to the SMV sign however, on grounds including its gaudy colors, and the fact that it is a man-made symbol, suggesting a lack of trust in God’s plan. A few groups of Amish, notably the Swartzentruber affiliation, simply do not use the triangle. This has led to legal conflict in some places, but generally is accepted in areas where they live. However, another traditional community has a different solution. The Nebraska Amish settlement at Winfield, Pennsylvania uses the triangle on the road, but then removes it when parked. You can see how that works in reader Jerry‘s photos here. The sign came off right after the horse was tied and before the horse was unhooked. It happened every time and I’ve only seen it here in Winfield. 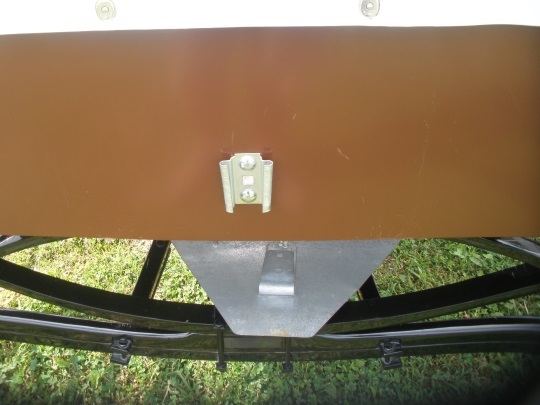 Hopefully you can see from the pic that a pair of matching brackets are on the buggy and sign. The sign sits on this bracket when moving. To my knowledge, Nebraska Amish in other areas (Big Valley and northeastern Ohio) do not do this. I am told by someone else who would know that this practice is a way to comply while on the road, but the removal of the sign is a symbolic gesture that it’s not a welcome feature on their transportation. Just another small example of the different worldly accommodations found across Amish society. I have been studying Amish culture for the past three years; and, I find that the Amish are willing to compromise in many more areas than we might first expect. What I do have a question about is this: What is the proper protocol when coming up behind an Amish buggie on the road? 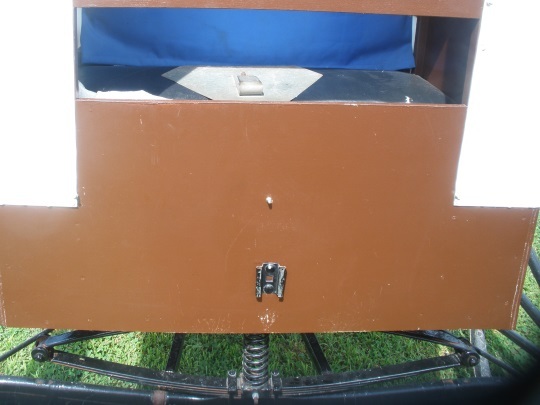 As it is, I would be perfectly content to just slow down and drive at a comfortable speed and distance behind them; however, that seems to almost make the driver of the buggie “nervous.” Most drivers seem to speed by them with little care for how it might affect the horse or driver. Is the best thing to pass them – safely – at a slower speed until there is some distance between us? Hi Barbara, thanks for your question. Your instinct is right, you don’t want to creep along at the same speed behind the buggy, that would be unusual. The driver will expect you to pass, and sometimes they feel badly for holding up traffic. Simply wait for a safe stretch of road and then pass at a moderate speed, being careful not to cut too close in front of the horse when you retake your lane. Hope that helps. The Nebraska Amish here in Big Valley might not take the SMV off at an auction or whatever, but if you pass by a place they are having church you’ll see they take the emblems off for the occasion. I’ve seen that many times. When they’re parked at homes they stay on as well, from what I’ve seen. Have never been in that community on a Sunday so interesting to hear they come off, thanks Kate. You’re right Erik. I don’t see the emblems removed at home though my Amish neighbor who I do a lot of taxi work for says she thinks there may be a few older people who still do. If you are on East Back Mountain road between Barrville and the #305 there is a Nebraska home with an open buggy garage and the backs of the buggies face the road. I always see the emblems on them but if I pass by a place they are having church all the emblems are off. Although probably unlikely, I was thinking that at least a few members of the community might be concerned about theft of their safety triangles. I think every house in north America has something like this, my place, my brother came into a stash of police tape that we probably shouldn’t have had (my Dad was not a police officer), and I know of people who ‘found’ stop signs (either that or their parents went to some surplus store somewhere and bought one for them). I am not Amish but I often ride my bike with a trolley behind. Drivers are very bad at both seeing the bicycle when they pass from behind and respecting the fact that a trolley cannot be smaller than it is and I cannot go any further in on the road for them to pass me easily. My trolley has a flag which signals its existence as well as two back lights if using when it is dark and the actual trolley is colorful but still some cars are not very respectful. Given that most people transport their children in this type of trolley one would think that drivers would be more careful. I tend to use bike lanes but in some cases driving on the road is necessary. 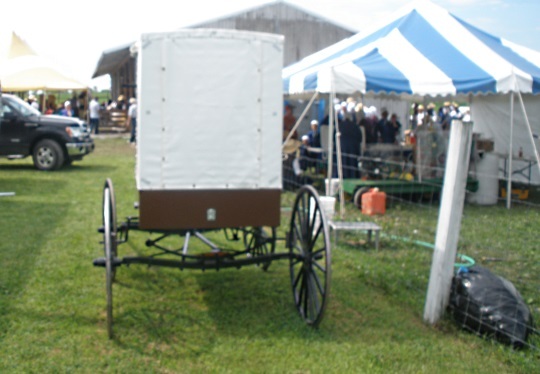 If nothing else, if the stricter Amish were allowed to change colors to white (buggy paint & canvas top), that would certainly make the buggy more visible at night, even without the dreaded triangle. This probably doesn’t belong in this category, but a quote from our local paper in the Arthur, IL, area written by an Amish woman: “I am glad so many children and adults, too are wearing safety vests when biking, walking or in open buggies and carts. It makes them a lot more visible, even in the daylight.” Quite an advance, I’d say.